A video by documentary producer Gary Charbonneau (see Vancouver Aquarium Uncovered) and animal rights activist Jen Dobell. Jen Non Smoking from Evotion Inc. on Vimeo. Documentary by Laurie Ladick, featuring Dr. Stuart Kreisman and North Vancouver Mayor Darrell Mussato. World No Tobacco Day 2015: Airspace confronts the "Tobacco Six"
Airspace used the occasion of World No Tobacco Day, May 31, to push back against the "Tobacco Six": the British Columbia grocery and drug store chains that oppose the end of tobacco sales in pharmacies. British Columbia is the only Canadian province that still permits pharmacies to sell cigarettes and other tobacco products. The plan was to spend about 45 minutes picketing each of the three grocery stores that represent half of the TOBACCO SIX: Thrifty Foods, Save-On-Foods (part of Darrell Jones' Overwaitea Food Group) and Safeway. There aren't a lot of Thrifty options, but we chose the one in South Surrey, in a mall called Morgan Crossing. While I carried a large placard that said "TOBACCO IN PHARMACIES! WTF???" on one side...and "JIM DORES, GENERAL MANAGER, THRIFTY FOODS IS A BULLY!" 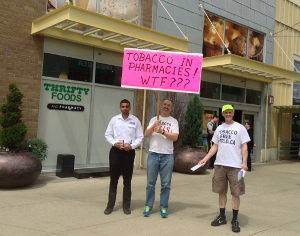 on the other, Marc and Dave handed out leaflets that explain exactly why we were picketing these stores (check out several stories about the issue of tobacco in pharmacies, including a Global TV BC report on this site. While we always encounter a few ignorant people (who refuse to take our literature and learn about the issue... and say things like, "Get a job! ", "Get a life! ", etc. ), the vast majority -- yes, even including several smokers -- were very receptive... and happy to chat with us, tell us their personal experiences with tobacco, thank us for what we're doing, wish us luck, etc. That said, the reactions of employees/managers/security of our target stores are always so funny! Obviously, no business wants to have protesters in front of it. But some of the things they say to us... and some of the lame arguments they put up are absolutely hilarious. Read more: World No Tobacco Day 2015: Airspace confronts the "Tobacco Six"